I sign up for new services/tools on a regular basis, usually from startups. Some promise to do "XYZ" better than tools I currently use. Some just peak my curiosity and I want to simply dig around. I would say 9/10 times, I end up not using the service/product I signed up for. As a startup, I can understand that speaking to customers is super important. Speaking with customers helps you to figure what's good (or hopefully great) about your product, where customers get stuck, how well are you solving their problems etc. But one thing that really irks me, is the (usual) flood of emails within the first 30 days. Each vying for my attention, to upgrade my account, view tutorials, hear testimonials. It's simply too much noise. It quickly turns to spam. If I don't use a product within a week of signup, I've already tuned out, so getting more emails is only going to cause me more pain. Here's an example from an unnamed startup. I received a total of 11 emails before I let my 30-day trial expire. It feels like a high-pressure sales person is breathing down my neck! Ben Watanabe wrote a great article on Medium describing UX lessons about opt-In forms from Louis CK. Louis CK hates SPAM. And he doesn't want to create more SPAM. So instead of automatically opting-in his website visitors into a mailing list, he lets them to opt-in by choice. I really, really like this approach. If you really care about users' feedback, have the empathy to respect their time, and their email inboxes. 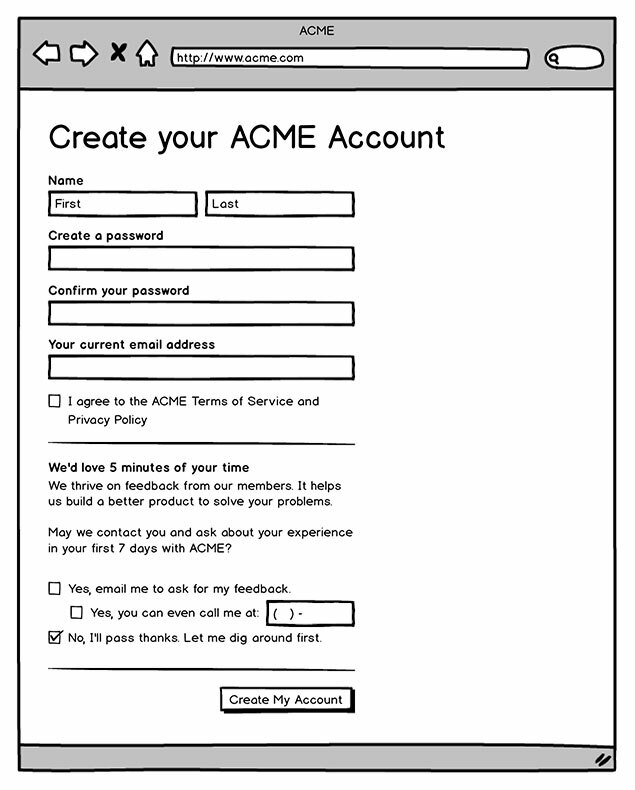 Here's a sketch of a what a more personal sign-up form could look like. It immediately creates a warm touchpoint, rather than cold, anonymous one. I plan to use this in future projects and ideally do some A/B testing to compare response rates. By default, selecting the "No, I'll pass thanks" option.